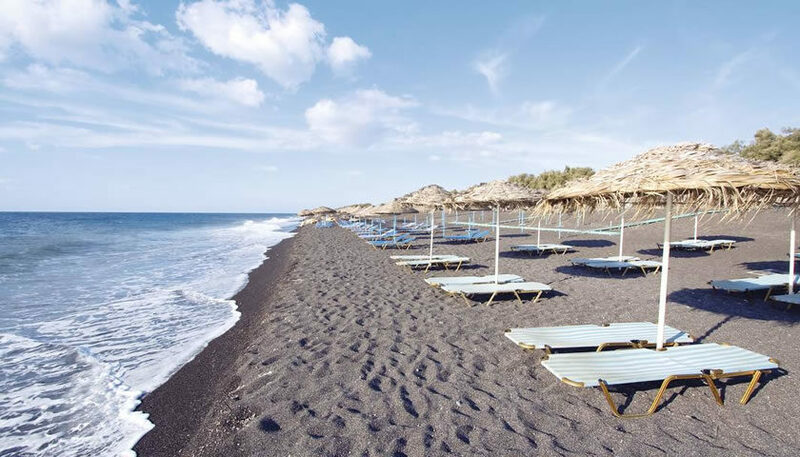 Perissa is a popular long beach covered by black sand at the southeast of the island. 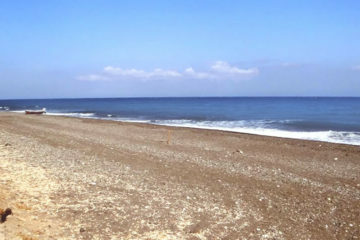 It is one of the longest beaches of Santorini and lies at the base of Mesa Vouno mountain that separates Perissa from Kamari, just before Perivolos Beach. It has black sand, crystal clear waters and it is E.U. Blue Flag awarded (2017). It is well organized with lifeguard, offering various facilities and services to keep you here all day long. There are beach bars which stay open from the morning until late at night, serving coffees, cocktails and light food at the bar or at the sunbeds on the beach. Some of them offer the sunbeds, umbrellas and showers for free under the condition that you buy something from the bar. In some parts of the beach there is a slippery volcanic stone in the sea, so you should be cautious when getting in and out of the sea.! For the sports lovers, there are beach volleyball courts where tournaments are organized. Various water sports are available, such as jet ski, windsurfing, canoe etc. from Wave Sport Club. For the more adventurous there are two diving centers, Mediterranean Dive and Santorini Dive Center. For the children, there is an organized water park with three water slides and pools. Restaurants and hotels of all kinds can be found at the area near Perissa Beach and the prices are relatively lower compared to other places on the island. There is also a camping at the beach which attracts many young people. The distance from Perissa Beach to Fira is about 13 klm and you can get there by car or by the regular bus service. There are also small boats connecting Perissa and Kamari, every half hour.